J. Cain, known throughout Latin America as a leading provider in an array of logistics solutions and services to global clients in various industries, also provides specialized supply chain consulting services, an expertise that has developed through managing a large-scale operation and facility. The J. Cain team is diverse, consisting of process and IT engineers, project managers and supply chain specialists who carry out process improvement projects, operations flow design, logistics processes evaluation, supply chain network analysis, IT solutions, and warehouse design and construction project management. J. Cain employs a number of frameworks when analyzing how to improve a particular supply chain or logistics process. 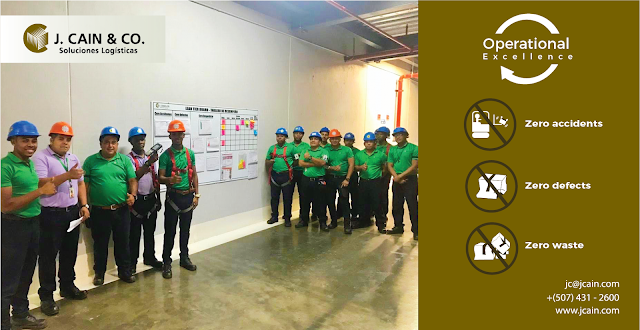 The general approach includes mapping processes and defining the applicable Key Performance Indicator (KPI), elements that are central in the implementation of the Kaizen/Six Sigma approach, which is commonly used by the team. Kaizen, or the act of continuous improvement, aims to eliminate waste from a process and is central in nearly every aspect of J. Cain’s operation. Recently, J. Cain collaborated with a global pharmaceutical company and longtime client to better understand strategies for optimizing the deployment of product within J. Cain’s world class warehouse using a Kaizen approach. Key considerations included time savings and resource efficiency, the client’s global goals and how they would apply to Latin America, and the control of costs through the efficient utilization of space. The end product was a safer work environment and a process that aims for zero defects and zero waste. The first step in the process was to conduct a two-week diagnosis phase, which included a deep dive into the existing data, including mapping and timing the entire value stream to identify waste. Additionally, the diagnosis phase included interviews with warehouse operators to better understand their perspective and sentiment concerning the current process. After the data collection and analysis were complete, J. Cain presented their findings to the client’s executive team, detailing the opportunities for improvement in the operation and the benefit of the project. Following the diagnosis phase, the project team worked to design solutions for each of the opportunities presented and implement them in the J. Cain and Client’s operations. Upon implementation, the team worked to measure the improvement achieved to ensure that the estimated benefit was achieved. This project proved to be a great opportunity for both parties, reaffirming their strong business relationship and in the process discovering more value, resulting in a safer and more efficient operation.